Ever search "Car repair near me"? If you have, you are not the only one. *Google Insights Search Query results. You can now build trust and increase service revenue at the time of this search. Video Testimonials are the MOST authentic reviews a potential customer can watch. Video Testimonials that are posted to YouTube (owned by Google) increase your search rankings and can be can be shared on social networks. 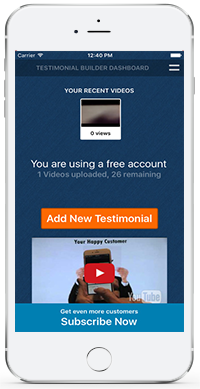 Testimonial Builder is the only program that helps you easily create, upload, and syndicate video reviews from Happy Service Customers. Spend 5 minutes with a happy customer after vehicle service and you've produced the ad to win your next sale.